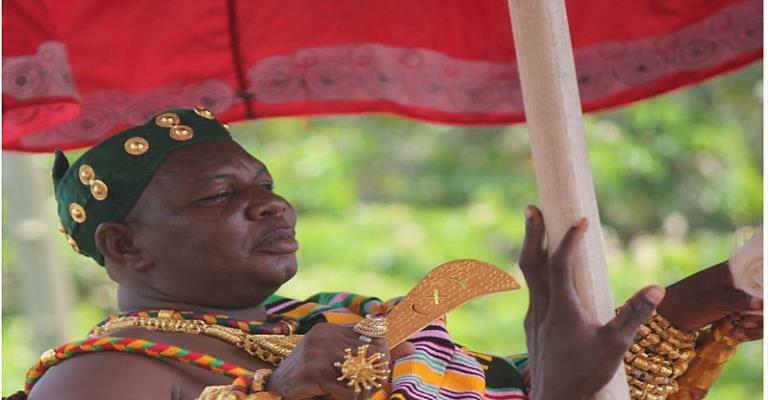 A concerned party in a case has indicated its preparedness to drag the Chief of Berekuso, Odeefoo Nana Oteng Korankye II for defying court orders and granting various parcels of land at Abokobi to members of the unsuspecting public. Real estate developing company, Manasseh Resources Limited has also requested that Odeefo Nana Oteng Korankye II and the Daily Guide to retract a story caption ‘Soldiers fingered in illegal demolition’ and offer unqualified apology to the company. The Chief of Berekuso had earlier used the news media including Daily Guide to accused Manasseh Resources Limited for demolishing properties and creating tension, panic and fear of public safety in Abokobi and its environs with the aid of alleged security personnel. But in an official statement issued in Accra, it noted that the company has not demolished any property at all contrary to the false publication in the media. “Unfortunately, the publication has been cited as the source for countless radio and television programmes which sought to create the impression that our company is engaged in forcible and illegal demolition of properties and structures in Abokobi with the help of military personnel. First and foremost, the said publication is wholly inaccurate and a subterfuge by the proponents thereof to deceive the unsuspecting public and subject our company to public scorn and hatred,” it said. It revealed however that Manasseh Resources Limited purchased its Abokobi Land from the Nuumo Nmashie Family, the Allodial title owners of the Land hence the issuance of Land Title Certificate by the Lands Commission, the lawful authority established by law to register all interests in land in Ghana, without any objection from any third party, including the Berekusohene, inspite of notice to the entire public. The statement cited numerous court ruling affirming the title of Nuumo Nmashie Family to the Land including a ruling dated the 7th day of July, 2017, where His Lordship, Justice Kwabena Asuman-Adu granted an order of interlocutory injunction restraining the Berekusohene, Nana Oteng Korankye II, his agents, privies, assigns, servants, workmen or otherwise howsoever from dealing with the Abokobi, Adjankote, Brekuso, Kponkposesemi, Danfa, Akporman, Abladjei, Kojokrom, Dedeiman and Teiman lands. According to the statement despite the court ruling, Odeefo Nana Oteng Korankye II, continues to defy the dignity of the court by granting various parcels of land at Abokobi to members of the unsuspecting public. A case in point is a recent grant of 3.55 Acres to one Kobina Woode. “It is our firm belief that it is these illicit acts of Odeefo Nana Oteng Korankye II, which have created the unnecessary tension, panic and fear of public safety in Abokobi, compelling our company to seek the protection of Ghana Police Service to protect the life of our workmen and property,” it stressed. The attention of management of Messrs Manasseh Resources Limited has been drawn to a news item with the above-mentioned caption published at the instance of Odeefoo Nana Oteng Korankye II, the Chief of Berekuso, at page 6 of Wednesday, March 27, 2019 edition of the Daily Guide Newspaper. Unfortunately, the publication has been cited as the source for countless radio and television programmes which sought to create the impression that our company is engaged in forcible and illegal demolition of properties and structures in Abokobi with the help of military personnel. First and foremost, the said publication is wholly inaccurate and a subterfuge by the proponents thereof to deceive the unsuspecting public and subject our company to public scorn and hatred. It is instructive to the note that our company acquired its Land at Abokobi from the Nuumo Nmashie Family, the Allodial title owners of the Land. Pursuant to the acquisition of the Land, our company has been issued with Land Title Certificate by the Lands Commission, the lawful authority established by law to register all interests in land in Ghana. It is further instructive to note that the Land was registered in favour of our company without any objection from any third party, including the Berekusohene, inspite of notice to the entire public. viii. Pursuant to the aforementioned suits, the Lands Commission published at page 24 in the Daily Graphic Newspaper, dated Tuesday April 30th, 2002, the Judgment in favour of Nuumo Nmashie Family of Teshie. ix. By a ruling dated the 7th day of July, 2017, His Lordship, Justice Kwabena Asuman-Adu granted an order of interlocutory injunction restraining the Berekusohene, Nana Oteng Korankye II, his agents, privies, assigns, servants, workmen or otherwise howsoever from dealing with the Abokobi, Adjankote, Brekuso, Kponkposesemi, Danfa, Akporman, Abladjei, Kojokrom, Dedeiman and Teiman lands. It is instructive to note that these judgments and rulings are conclusive that Berekuso Stool/Family has no title to Abokobi Lands. In fact, the proponent of the publication, Odeefo Nana Oteng Korankye II, the present occupant or head of Berekuso Stool/Family has expressly been injuncted by the court from dealing with Abokobi Lands. (Please see a copy of the order annexed to this Rejoinder). Unfortunately, Odeefo Nana Oteng Korankye II, continues to defy the dignity of the court by granting various parcels of land at Abokobi to members of the unsuspecting public. A case in point is a recent grant of 3.55 Acres to one KobinaWoode. It is our firm belief that it is these illicit acts of Odeefo Nana Oteng Korankye II, which have created the unnecessary tension, panic and fear of public safety in Abokobi, compelling our company to seek the protection of Ghana Police Service to protect the life of our workmen and property. However, our company has not demolished any property at all contrary to the false publication in the media. Having been injuncted by the High Court from dealing with Abokobi Lands, Odeefo Nana Oteng Korankye II is now desperately seeking refuge under a purported Supreme Court judgment to impugn the title of Nuumo Nmashie Family when he was not a party to the said Supreme Court proceedings. In fact the subject matter, issues and the reliefs sought in that Supreme Court proceedings had nothing to do with Abokobi Lands. Our understanding of the issue which went before the Supreme Court was whether the procedure adopted by Nuumo Nmashie Family was proper in law, to entitle them to recover possession of the Land known as Airport Hills from Finali Ventures in contradistinction to issue of ownership or title to the said Land. It is trite learning in law that title to land is not synonymous with right of possession of the land. It is in this perspective that the judgment by the Supreme Court ought to be looked at and not to construe same to mean defect in title of Nuumo Nmashie Family or declaration of title in favour of Berekusohene in respect of Abokobi Lands. It is regrettable to note that the publication and pursuant radio and television programmes, so far, have been entirely one sided and no attempt whatsoever was made by the media houses to get our version of the story. Responsible journalism dictates that not only an objective story be presented to the public but at the very least, both sides must be given a fair opportunity to present their story. We expect that the media will accord this publication the same prominence that was given to the publication for the discerning public to form their own independent judgment of the matter. Further, we demand Odeefo Nana Oteng Korankye II and the Daily Guide to retract the story under reference and issue unqualified apology to the management of our company and the general public for carrying out such untruth story failing which our lawyers are on a standby to commence an action in court for defamation. With respect to Odeefo Nana Oteng Korankye II, his henchmen and acolytes, we are assured by our grantors that their solicitors are taking the necessary steps to bring the conduct of the chief to the attention of the court for him to be punished for contempt of court.